PALEO JAY SMOOTHIE CAFE: Paleo Smoothie- the undeniable benefits! Many are resistant to the idea of a Paleo Smoothie. .. It's "too much work", "I don't have a Vitamix and they are too expensive", and "I need to chew!" Yup, I've heard that last one as well! A smoothie is fast. 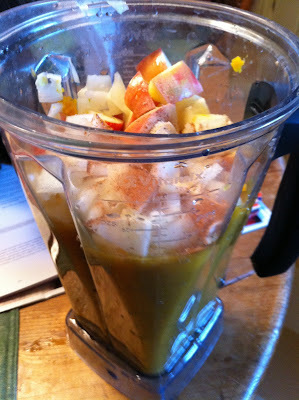 You throw together the ingredients in a few minutes, just putting them in the canister of your blender. Frozen is fine, and very cheap and convenient- fresh is also fine if you have it- even woody, past-their-prime veggies from the garden, including stalks and stems are fine in a Vitamix blender- they are completely liquified! So, there is the basic recipe for the Paleo Quick Start Smoothie! Simple, fast, and very satisfying; but the main point is this- it is all the nutrition you need for optimal health, ready for you! The other advantages? A smoothie is bioavailable. The cell walls are all broken down, rendering the nutrition locked inside readily available for digestion. The nutrients you put in the smoothie are ready to absorb! A smoothie is transportable. I drink a glass of about 8 ounces or so each morning along with breakfast; sometimes it is my breakfast... (did I say fast and easy?) Then, I carry along two 8 oz. canning jars full in my insulated lunch box, which I drink spaced throughout the day... this not only keeps me in complete nutrient heaven, but keeps me completely hydrated throughout the day. The smoothie is ALL IN ONE. If you want, all you need, all day long, is in that simple drink! Nothing else is necessary; I like to think of everything else I consume as "recreational eating", with the exception of seafood and organ meats, which don't need to be "every day" meals. There is no waste, and it is really quite cheap: You get a huge "bang for your buck" with a Paleo smoothie, since every tiny BIT is consumed- if there is any left over, you can either drink it the next day, or freeze it! The smoothie fills you up totally- you will not be hungry at all, all day. This benefit is huge; the good fats, protein and everything else your body needs satisfies your body so that it doesn't constantly cry out for more more more! You will not even be tempted by your co-worker's donuts! And lastly, the smoothie tastes good, but not "too good"! That may sound strange, but we are currently surrounded by engineered foods that taste so good that we cannot resist them. (Especially if we are lacking in nutrients from a normal American SAD diet, and our bodies are constantly hungry) They are really hungry for nutrition, but all our bodies can say is eat eat eat! When you drink enough of your smoothie, you don't want any more. You are satisfied! So there you go- no excuses- this is the easiest way to adopt the Paleo Diet that there is! Do it!! And make enough for the whole family- that's easy too, with a Paleo Smoothie. OH, and P.S. - If you have gotten my new book Perfectly Paleo Exercise, as I know through my sales that many of you have, I would sure appreciate some clicks of "yeah" or even "nay" on the book vendor sites like Amazon or the iBookstore! A review would be golden! Thank you!